Leo Peukert worked for the Vereinigten Theaters (United Theaters) in Munich from 1904 to 1908. In 1909 he was engaged at the Lustspielhaus in Berlin en from 1911 onwards he appeared in silent movies. In 1914 he married actress Sabine Impekoven. He appeared in over 160 movies, among them "Hotel Sacher". He died in 1944 in Tingen and was buried at the Waldfriedhof in Munich. 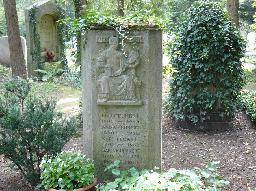 The grave of Leo and Sabrina Peukert at the Waldfriedhof in Munich.